For a happy relationship with your cat, go beyond the looks and make your pick based on demonstrated breed behavior. This is the advice of the Harts, two experts in animal communication and behavior, whose new book takes the process of selecting a cat to the next level by offering data-based behavioral profiles of a wide range of cat breeds. Developed over a lifetime of research and through extensive interviews with eighty veterinary experts, the profiles are presented in easy-to-use graphical form. A history of the development of different breeds is presented, and then breed-specific differences across a range of variables are discussed. These include twelve behavioral traits, in areas such as affection, sociality, activity level, and litter box use. After giving guidance about choosing a cat, the authors present some strategies for avoiding problem behaviors and resolving those that emerge. They also share fascinating theories about the origins of various common cat behaviors, including purring, yawning, eating grass, "flipping out" on catnip, and staking out territory. While the focus is on purebred cats, there is also lots of good information for owners of blends. The book ends with helpful guidance on further reading. 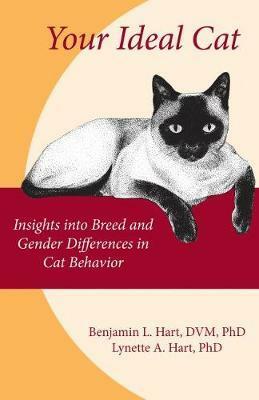 Based on the latest science, this is a great book for anyone interested in the fundamental building blocks of feline behavior, and an invaluable handbook for cat owners. Benjamin L. Hart, Distinguished Professor Emeritus at the UC Davis School of Veterinary Medicine, has always taken a passionate interest in animal behavior, which has had an immense effect on his life's work. At UC Davis he developed the first comprehensive teaching program in companion animal behavior and was chief of the Behavior Service in the veterinary hospital. He is the author of almost two hundred publications, many of which focus on resolving behavior problems in cats. Lynette A. Hart studied animal communication during her doctoral education at Rutgers University. She was founding director of the Center for Animals in Society at the University of California, and among her approximately one hundred publications are landmark studies on the socializing effects of animals for people with disabilities, and the grieving process associated with the death of a beloved companion animal. She was instrumental in establishing the country's first pet loss support hotline.